Lake Königssee is a beautiful emerald green glacial lake set in the Berchtesgaden National Park in Bavaria Southern Germany. There are three notable waterfalls in its vicinity. To see them it is necessary to take a trip on the boats that travel up and down the lake. 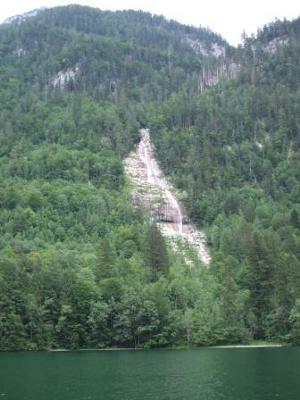 The first fall is the Königsbach which tumbles 150m in several stages. The only visible section from the boat is the main fall of 40m. To view the other smaller falls evidently involves a difficult scramble up the mountainside through the trees. 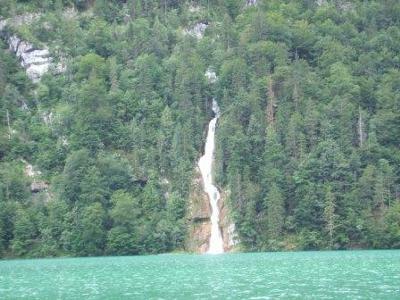 The Schrainbach fall is located on the opposite side of the lake and is a clearly visible 80m drop into the lake. To see the final fall you need to disembark at Salet and walk further up the valley to the small lake Obersee. 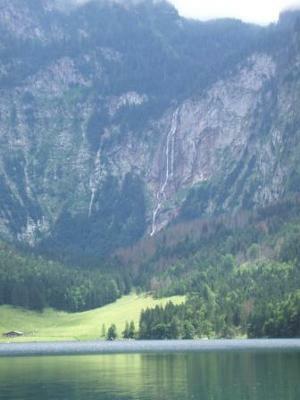 This lake is dramatically enclosed by the mountains on three sides, and on the far wall is the slender Rothbach waterfall which freefalls 470m, making it Germany’s tallest. It is possible to hike to the fall but it would take a couple of hours.